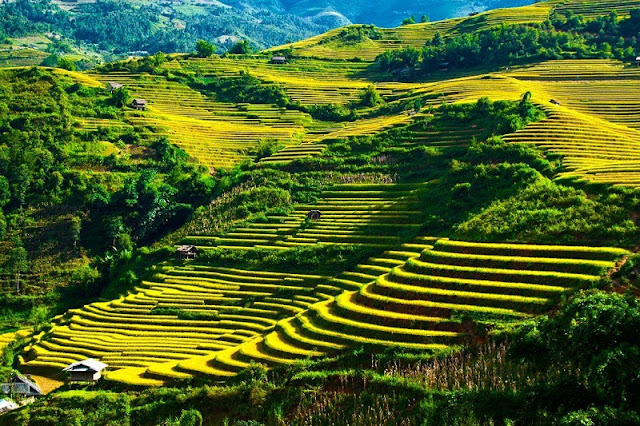 Dong Van is an upland district of Ha Giang, it is far about 146 kilometers from Ha Giang. Dong Van has Lung Cu that is concerned as 'the roof of Vietnam', famous for natural scenery, fruits and precious herbs... The district has 19 communes, in which there has 9 communes bordering with China. In the winter, temperature down to 10C, the highest temperature in the summer is only 240C. Dong Van is famous for delicious fruit such as: peaches, pl ums, pears, apples… and precious medicinal plants such as: ventricles, salmon, cinnamon… This place inspires for artists to create the unique painting about: mountains, rice terraces… Dong Van is the northernmost district of Ha Giang province. It is located in the ruggered rock upland of our nation. Here, visitors will have opportunity to admire the beautiful scenery and know more about everyday life of Dong Van people, one of the points that visitors should visit the Dong Van market. Dong Van market which has trading of ethnic such as: Tay, Nung, Han, Mong, Hoa, Dao, Kinh… The market meets on Sunday every week and holidays, New Year. Market located at the root of Don Cao Mountain, beside the Dong Van ancient town. The whole market is designed with the style of Vietnam-China and it has interference with feng shui plateau. There has the rows of stone pillars with sophisticated carve. Dong Van market situated in the middle of Dong Van highland valley basin as an impressive point. This market is designed with U-shape structure and architecture on stone was built during the period from 1925 to 1928. From a distance, visitors will contemplate the wonderful and vivid scene of upland fair. From the porch, the seller and the buyer exchange goods by their language. Inside the market, there has range of merchandises that show all kind of items along with the sale of livestock and poultry to serve the needs of customers. Like some other upland fairs, Dong Van fair severs ethnic cuisine such as: Thang co, triangle cake, corn wine… Here, visitors will has chance to soak into vivid atmosphere and learn more about the Dong Van ancient town. In addition, coming to Dong Van is opportunity to test your courage by passing abyss.